... we should be grateful that someone saw that Never Home Alone: From Microbes to Millipedes, Camel Crickets, and Honeybees, the Natural History of Where We Live would not only be utterly fascinating, but also turn out to be an important voice in the science-based argument in favor of more biodiversity ... Never Home Alone is a spirited romp through the vast diversity that inhabits our daily lives and how we’ve changed our ecosystems, often for the worse ... The story of cockroaches is only one of the compelling narratives. It probably takes the soul of an entomologist, or maybe of a 9-year-old child, to love these bugs as much as Dunn does. Still, it’s hard not to be occasionally charmed by his prose, as when he catalogs the arthropods with whom we share our homes... And it’s hard not to share, at least a little, his awe at their diversity, even in a single household ... There’s a real sense of 'gee-whiz' in this book, but it’s mostly in service of Dunn’s overarching goal: to preach the preservation of biodiversity, not only in the lush forests and streams that fit our traditional image of nature’s abundance, but in the most humble places, too, where the vast majority of us will have most of our cross-species encounters — our basements, mattresses, refrigerator drawers and showerheads. 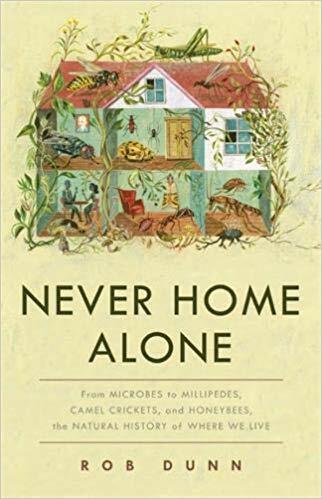 In his fascinating new book, Never Home Alone: From Microbes to Millipedes, Camel Crickets, and Honeybees, the Natural History of Where We Live, Mr. Dunn brings a scientist’s sensibility to our domestic jungle by exploring the paradox of the modern home ... Mr. Dunn is a fine writer, wringing poetry out of the microbial explorations of Antonie van Leeuwenhoek, who spent half the 17th century documenting all the tiny living things around him ... Mr. Dunn also gracefully explains, without getting bogged down in details, the technology that has allowed scientists during the past decade or so to sequence the DNA of millions of previously unknown microbes, making his book an excellent layperson’s guide to cutting-edge research. What did you think of Never Home Alone?